Last summer, I didn't have a job for a good 2 months. I was pretty good at the temping game. I only had a lag of a week between jobs - usually. During those two months, I didn't have much or any money. I ate packaged ramen w. dry powder packets for most meals. I ate mostly garbage. Thank god for $1 pizza restaurants. I was pretty anemic. Bruises started to appear. I didn't have an air conditioner during a blazing heatwave. So I sweated through till mid-October. I was out of a relationship. Had no interest in pursuing another relationship, because knowing me - I'd forget that I exist and just become whatever I thought the other person wanted. Then if and when that failed - back to Square One just older. On top of that, I had spent a few years toiling at this art project that seemed to have lost steam. I really wanted to be a full-time artist, but no one seemed to want me any more. I did some soul-searching with a therapist I couldn't afford, because I needed some answers ASAP. Perhaps, a Swami, Palm-Reader, or Psychic Spiritual Advisor could've done me good, but I needed to get real. In the theme of being real, may I add that I was in my early 30s? I was 32 to be exact. I was 32 and realizing that there were some other things that I was good at and would love to continue doing for a job eventually a career. But such prospects require a lot of work, a lot of rejection and sometimes (a lot of the time) don't pan out. Some people might even consider me "Too Old." Furthermore if I haven't mentioned, I'm gay. I came out on the late side. Aside from the after school special feeling of "Well he's fine, he found himself," dating people - I get judged a lot for not coming out sooner. Sometimes I get judged for not being up to speed on all the subcultures or all the know how of Gay. I felt like the kid in class that Can't Read as Good. To up the ante a bit more, I watched all my friends either gay or straight (there is no prejudice here) get into serious relationships, serious careers, serious babies, serious marriages, serious property ownerships. Meanwhile, I felt like I just got to the party. Boasting a furrowed brow and pursed lips, I felt like an Alien. Maybe had I heard certain sentences from authority figures that built me up instead of making me feel confused and defeated, things MIGHT'VE been different. Maybe if something could get perfected back then, some THINGS would be PERFECT now. But I can't change that. I don't mean to throw the Most Raging Pity Party either! I admit things have gotten better since then, but that "Alien" feeling does come up here and there. I'm the emotional equivalent of a Single Mom Nodding Off During Night School. Anyhow - if you at all related to the past few paragraphs with some empathy, you might enjoy this new issue of Buffy the Vampire Slayer for this very reason. 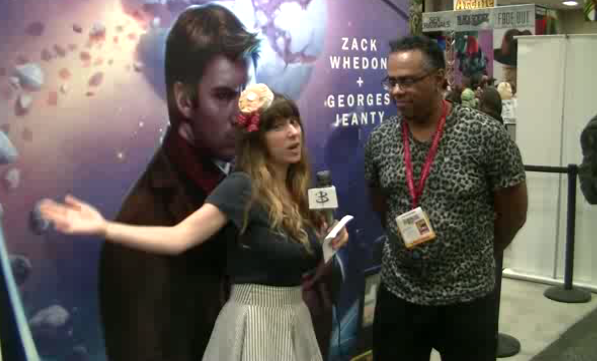 Last but definitely not least of our San Diego Comic Con coverage is this little gem of an interview coming right up. We have Buffy writer Christos Gage and actor/writer Nicholas Brendon talking about Buffy, Angel, Feet, Pancakes, Katherine Hepburn and there may have been some mention of diapers and sheep that landed on the cutting room floor. Maybe not, who's to say? The point is: We honestly don't know wtf happened here, but it is obviously whacked. Enjoy! Thanks to Nick, Christos, everyone at Dark Horse and extra special thank you to San Diego for giving us a Hell of a time this year. 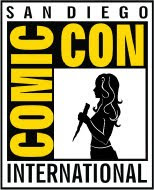 Look out for our final SDCC interview tonight with Core Scooby Nicholas Brendon and Buffy main writer Christos Gage. It was a really weird time! DO. Not Miss. It. 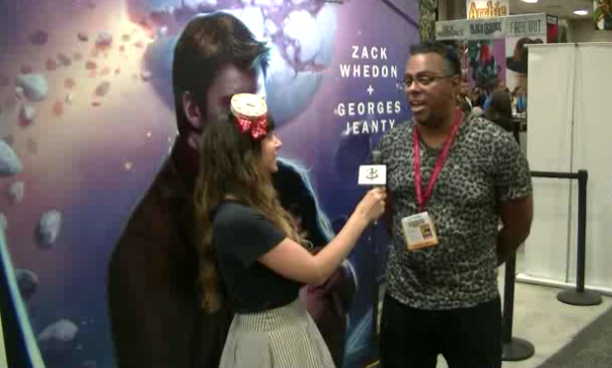 Buffyfest was able to get a few minutes at the convention to talk with former Buffy artist Georges Jeanty about his recent work on the Serenity: Leaves on the Wind series for Dark Horse. The interview was great but unfortunately due to technical issues with our video recording, the audio of conversation has become badly corrupted; so a transcription of the interview is being made available instead. Sad face! Then again, some people prefer to read over video, so enjoy! Thanks Georges for primping my hair before the interview began! Buffyfest: Hi this is Tara with Buffyfest at San Diego Comic Con Day 2. 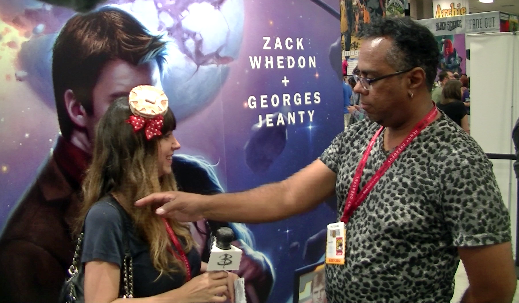 I'm here with the very charming Georges Jeanty artist from Buffy, Serenity…long time with Dark Horse. 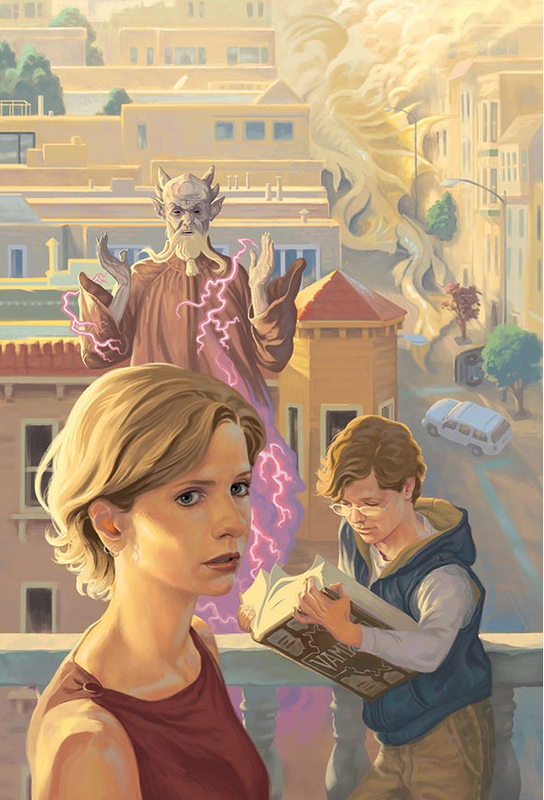 Buffyfest: Now that Leaves on the Wind is done, what was your favorite part about that project? GJ: Uh, the ending! Haha. The fact that it's over. Haha. I loved it, but man was it hard. It was something that was hard to do. I loved working with Zack Whedon. 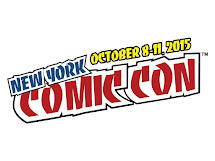 And… all of the characters. I loved Buffy for 6 years. 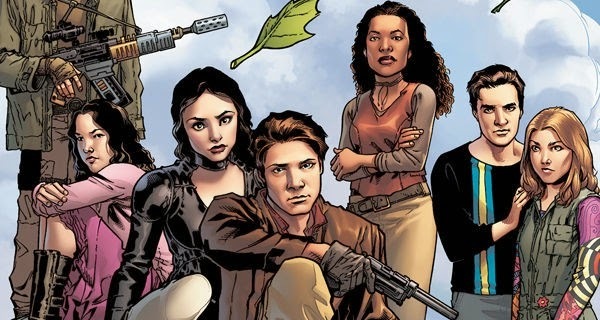 I would never say no, but it was nice and refreshing to do something a little different - but still sticking with the Whedonverse because that style of writing is great, great storytelling. So, I had a blast. Buffyest: Was it difficult going from these real life settings with grotesque monster faces on Buffy to nothing but humans in crazy Sci Fi environments [on Serenity]? GJ: It was, and it was even more arduous because there were 7 characters you could argue the ship is the 9th or 8th character in this case. So it was, man I had references for everybody and every time I had to draw someone... God forbid they were all in the same room together I had to get references just for the little faces. So that's what was hard, that's what took a while. But it was great to do because everything was there. So it was almost like cooking this incredible stew and you had all the ingredients and it was just up to you to make sure they all came together well. Buffyfest: And that leads nicely into this question: was it difficult to balance the visual dichotomy between Serenity’s tight, confined spaces and these huge open expanses with just a spaceship and maybe a rock in it? GJ: Good use of the word dichotomy, and yes, you are right! I really tried, because of course when it comes to the show there is a sense of claustrophobia on the ship. It's not a fancy ship and it’s not a luxury ship. It’s a… it’s a “boat” they call it because it’s something that’s very functional but not luxurious. And you right, when they’re out in space I had freedom over pretty much what I wanted, as much space as I needed and how I wanted to go about that was totally up to me. So I was very conscious of the dichotomy and I really tried to space it so the interiors had the claustrophobic feel and then give the exteriors this very broad landscape. Buffyfest: Now, between the Buffy books and Serenity, who is your favorite character to draw? GJ: ....Aww, that's like picking your favorite kid. GJ: No, I can’t do that. Well… I loved Buffy. Buffy was great because… she’s the girl I came with to the dance. And, um… I will say Mal. Because he’s the one I had to draw the most, I felt the most comfortable with him. They were all great, but I’d go with the main characters of the shows. Buffyfest: Now, how are things with Future’s End? GJ: Future's End is good! That’s the new DC book that’s coming out now that I’m doing a few issues of. But I’m actually going from Future’s End to now I’m going to be the regular artist on Batwoman. GJ: In another few months, that should be coming out. And, strangely enough, there’s going to be vampires. Wonder how that happened. Buffyfest: I’m sure it’s a coincidence? 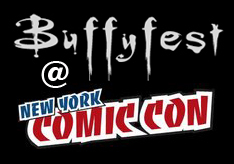 Buffyfest: So, when are you going to come back and do more Whedonverse? GJ: ....Well, I'm still talking to the editor and I would never want to go too far away from Buffy, and we’re talking about a project later on that would be perfect for me to come back. Buffyfest: We’ll love to have you back. GJ: I’ll love it totally to be back. Buffyfest: Thank you SO much for talking to us. Buffyfest: Thank you so much!